Question: When do I sow pumpkin? I read in gardening magazines pumpkin can be sown from spring to autumn in the subtropics. But advice on seed packets (and some magazines) suggest that pumpkin should only be sown from spring to summer. I have a garden at Camp Mountain 4520 where we do not get frost, please help. Subtropical springs are hot and dry, conditions which stimulate pumpkins (Cucurbita moschata) to almost exclusively produce male flowers. I also find that European honeybees aren’t very effective pumpkin pollinators, so each morning, while the pollen is fresh and viable, I hand pollinate any female flowers. Traditional cultivars, like ‘Beaudesert Blue’ and ‘Hartley’s Ironbark‘, require 125 – 150 growing days. They fruit best after midsummer, responding to decreasing day length (and increasingly long nights). Exhibition pumpkins, like ‘Atlantic Giant’ require 150 days or more, but modern cultivars, like ‘Butternut’ require just 80 – 85 days to crop. Pumpkin should be harvested before the end of autumn, so calculate your sowing date by working backwards according to the time the cultivar you grow takes to fruit. Sprinkle half a handful of dolomite per square metre and rake this into the surface a fortnight to three weeks before sowing. The calcium eliminates Blossom End Rot, caused by calcium deficiency. Plant pumpkin into mounds of well dug, compost rich soil about 15 – 20cm high, or sow three seeds per mound and remove the two weakest seedlings, retaining the strongest. Pumpkins need 6 – 8 hours full sunshine to develop fast, and too much shade encourages mildew. Remove the end of the growing point once a pumpkin fills a garden bed. Water plants in the morning and avoid wetting the foliage, both help reduce the risk of mildew. Pumpkin tend to develop mildew once they begin to flower, and spraying foliage weekly with a solution of one part pasteurised cow’s milk per five parts water effectively retards the development of this fungus. 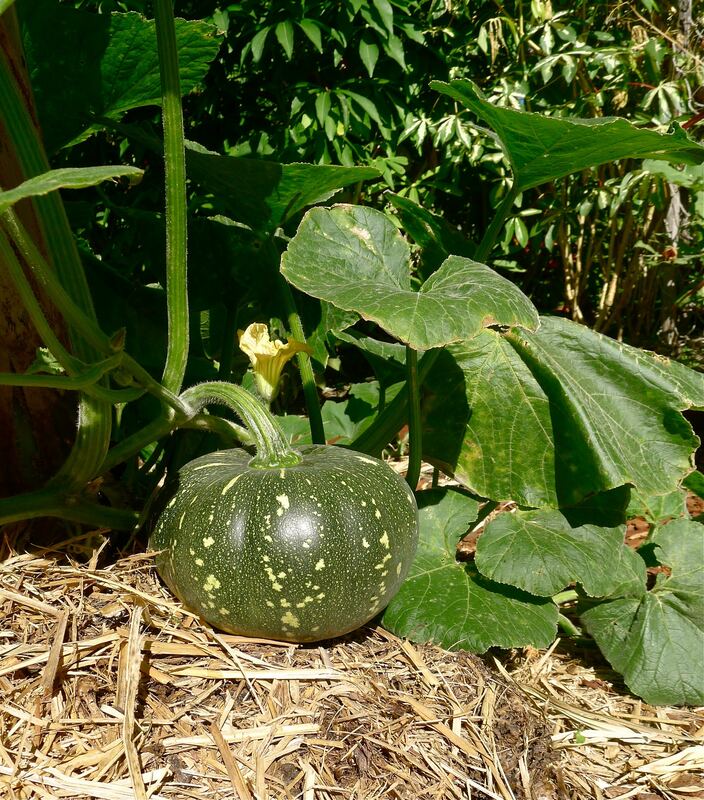 ‘Jap’ Pumpkin, Cucurbita moschata ‘Jap’ aka ‘Japanese’ or ‘Kabocha’, is an old-fashioned pumpkin cultivar suited to hot, humid conditions, well worth trying in the subtropics. Allen K: “Jap pumpkin is so productive. 20+ pumpkins in a season. And if strong and healthy it can do that 2 years in row if no frost. Just cut back but keep some well rooted sections”. I live in Rockhampton, QLD & I sow my pumpkin seeds when the wet season starts. Plenty of chicken poo & garden lime (calcium). Mainly hand pollinate, but some were done by the bees. Very productive that I share them with neighbours and work colleagues. Hi Jerry, I love looking at your works of Art. Jerry, I lived in South Florida, USA for many years. Now I have moved to Jamaica, West Indies. Jerry, I have always been a lover of Kiwi Fruits. I have tried several times while in South Florida to grow such fruit by sewing the seeds with no luck. Please tell me Jerry! What are my chances try my luck again with Kiwi seeds or young Kiwi plants here in the very sunny Jamaica. You have next to no chance of success. Kiwifruit must have a warm temperate climate. In the subtropics or tropics warm, damp soil invites root rot fungi, deters pollination, while fruit and foliage suffer from bacterial and fungal diseases. Save yourself effort and heartache and grow Dragonfruit, Passionfruit or Granadilla instead – something that relishes your climate.